Events are time-consuming to prepare. There are many things to care about. LED Screen installation is one of them. It is a long and bothersome process… Well, It was. Our products can solve many issues arising while planning an event. Mobile LED screen saves time. Traditional setups need truss preparation before every event. It requires a few working hours of well-trained professionals only to prepare the screen to work. Before they even finish to plan their setup, our screen will be already up and running. It only takes as short as 15 minutes. One person can prepare it and maintain during the entire event. See how simple it is prepare our enclosed mobile LED screen – MobiLED. It comes in handy when you want to move your screen within the venue or simply want to use it on multiple events within one day. Most noteworthy thanks to a lower operation costs you can offer better rates for your customers. Make more money by saving your time. Work less – earn more! That might sound strange but it case of our screens it is actually true. Thanks to much faster screen preparation, you can better manage your crew. Lower costs allows you to be more competitive on the market! Finally it is noteworthy that ability to do more events through the year will quickly offset higher price of the trailer. 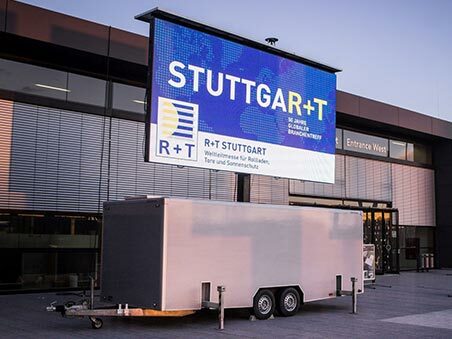 One operator for LED screen trailer. When your team arrives on-site, they need to conduct laborious preparation ahead of the show. Screen needs to be assembled right form the scratch before every event. That creates risk of damaging delicate LED cabinets. It’s not the case with our units. These are ready-made solutions designed to be operated by one person only. 15 minutes vs 4 hours*. Most of the job is already done by us. LED panels are attached to the frame. Now it’s time to simply unfold your screen. You can do it by a press of a button. Optional remote controller makes it easier than ever before. Entire set-up is ready in minutes instead of hours. 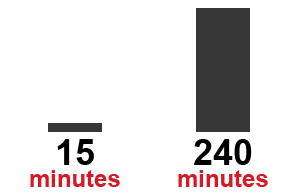 * regular screen setup time depends mainly on the size, in case of mobile unit, screen size doesn’t matter. Better rates for your clients. You don’t need to use stationary truss as well as building out a screen on site. That means you save a great deal of money. Consequently, this allows you to offer better rates for your customers. Modular LED walls are a standard solution commonly being used among event companies. It requires careful planning before installation as well as skilful crew to assemble on-site. You need to pick the right place to prepare your screen and make sure that the whole construction will fit. Frankly, there are many more problems to deal with while assembling such a structure. What if there is a better solution? Something that will significantly cut your costs as well as save plenty of time. Our mobile LED screens allow you to put your business to the next level! Initially, we were focused on fixed constructions. Later we realised how much time and effort it takes to prepare such screen, not to mention the costs incurred. 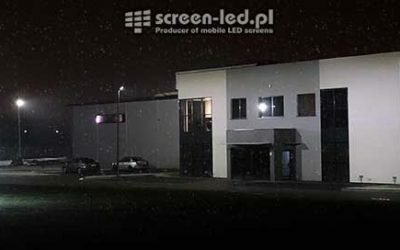 That’s where our LED screen trailers came into existence. 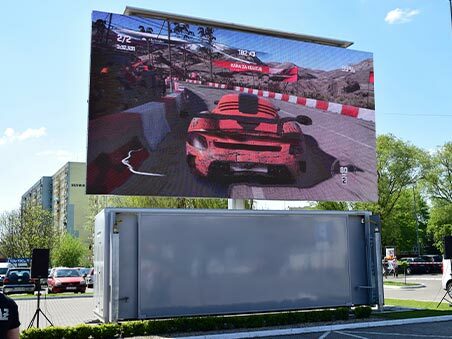 An outdoor LED screen mounted on top of the trailer. Sound simple? Its principles are simple but it’s no walk in the park to design. We pay special attention to details hence we can be sure that our products will be absolutely top of the line. Throughout the whole process of design, we work closely with our customers. Active participation allows them to make changes in design therefore the final product will precisely meet their requirements. As mentioned above it can be fairly straightforward design like already built out screen mounted on a trailer. That’s nothing but our simplest and most economical solution. We provide far more sophisticated products for more demanding customers. 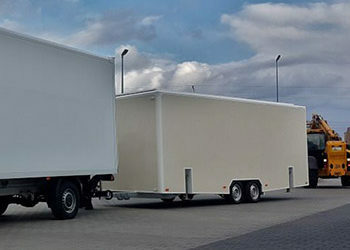 Our enclosed units provide great protection against weather conditions and during transport. We install our biggest screens on self-loading containers. Finally, it is worth noting that this convenient, future-proof solution has the potential to replace modular screens in certain situations. Simple training required only. Flexibility makes it a great solution for those looking to enhance their business. Or check our mobile LED screens. 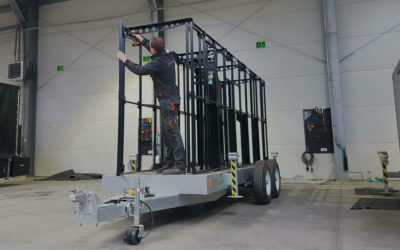 Open LED screen trailer – PlatformLED. 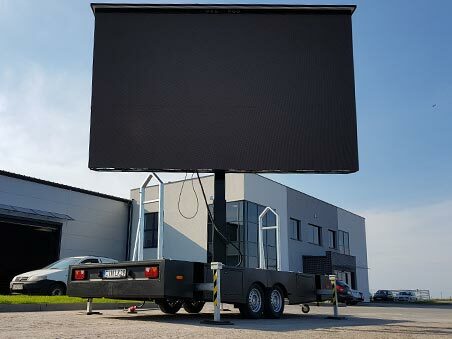 Enclosed mobile LED screen – MobiLED. Screen in the container – ContainerLED.